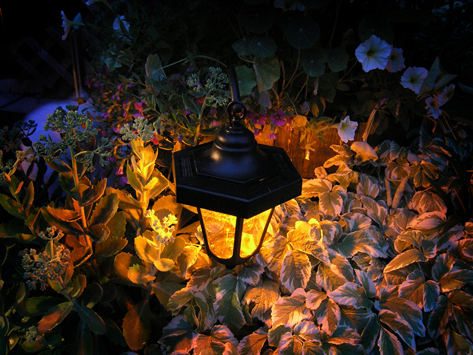 Solar garden lights use to be quite expensive and would not last long or shine too brightly. But as more and more people are turning to alternative energy sources, the solar power industry has advanced to the point now where solar garden lights are able to capture the suns energy more efficiently, shine brighter, and last longer. They also come in a range of different sizes and styles to fit many different landscaping design needs. Landscape lighting, or outdoor lighting, is important for a number of reasons: it makes the garden more homely at night, is more attractive to potential buyers, and is beneficial for security reasons. If it is done wrong, it can wash out the colors and features of plants and can also cast imposing shadows across the garden. Many people believe that outdoor landscape lighting is complicated and expensive, but it is not, especially if you use outdoor solar garden lights. The first thing to consider when thinking of a garden lighting plan is to ensure that there is enough outdoor lighting for safety and security. This includes lighting for steps, driveways and door entrances. Once this is covered, the next step is to look at ambient lighting, or lighting that enhances the feel, look and style of your landscape. When buying light fixtures for the outdoors, it is key to spend wisely. Cheap, low quality solar equipment won’t last long, shine bright enough and will just add stress and costs to your landscape lighting design. Solar garden lights are made up of low voltage LED lights, which can last a number of years and are commonly powered by a rechargeable NiCad battery. Each light has a solar panel on the top and a light sensor to know when to switch on and off. Most LED solar garden lights these days can provide up to 10 hours of light. The first thing to think about even before looking at decorative solar garden lights, is how you want the garden to feel. 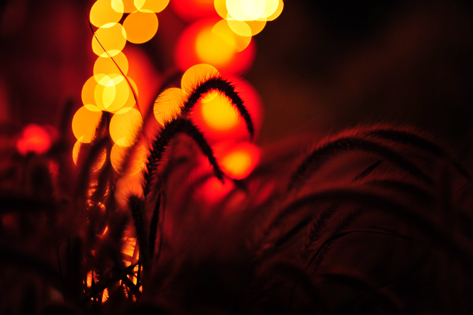 A garden can feel more lively and festive by using colorful and decorative lights, or a garden can feel more romantic and relaxed by using rustic orange and white lights. Ground Stake Solar Lights: These are the more common solar powered garden lights. They are versatile, and easy to install. They come in short and tall sizes. All you need to do is push them firmly into soil and they will stand upright. Uses for garden stake solar lights include ambient lighting and lighting a drive or walkway. To avoid making your path lighting look like a runway, you need to alternate the side of the path you place the lights. Solar Powered Recessed Lights: For step or deck lighting, you can install recessed stainless steel solar garden lights, lights that are fitted within the steps or the deck. They are mainly used for safety reasons but also make a landscape more aesthetically pleasing. Hanging Solar Lights: Can be used for pathway and driveway lighting, doorway lighting and outdoor celebration events. You can get them in a range of different styles such as Japanese lanterns or Victorian lamps. Solar Spot Lights: These are used for accent lighting as they provide a focused point of light. They can be used as decorative outdoor lighting to highlight the trunk of a tree, a fountain, a statue, a bush of flowers, a pond or other landscape features you want to showcase. Solar String Lights: Mainly known as Christmas lights, the more modern versions come in a range of different sizes and styles. They work great on decks and patios as it makes the area look like a European café, and can also be used to outline driveways and walking paths. Solar Outdoor Rope Lights: Rope lights are made up of LED lights that form of a rope. They can be used to wrap around a tree, hung on fences, or outline flowerbeds. They are very versatile and come in a range of colors. Sun Jar: The Sun Jar is a designer, decorative solar garden light. They are vintage style jars that light up at night, easily placed anywhere around the garden or on a table. 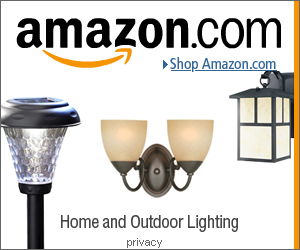 Motion Detector Solar Lights: These lights are becoming more popular and are being used as security/intruder spotlights. They are usually installed around the garage, or the front and back door. Floating Solar Lights: These are ideal for placing in a pond and will highlight the area at night. The placement of your solar powered garden lights is essential. They need to be in areas where they can get a few hours of sunlight a day. You need to make sure that they are not covered up by plants or tall grass, not only because it will block the sunlight, but when the light comes on at night it will then cast unwanted shadows across the garden. You also don’t people to be able to see the light fixtures, so look to hide them behind rocks or big plants. One other thing to keep in mind is to keep the color of the light consistent. This is a small but important detail, as different light fixtures can give off different shades of light (white, warm orange, cold blue). The many advantages of outdoor solar garden lights makes landscape lighting easy and non-expensive. Anyone now can design their landscape lighting just how they want their garden to look and feel. 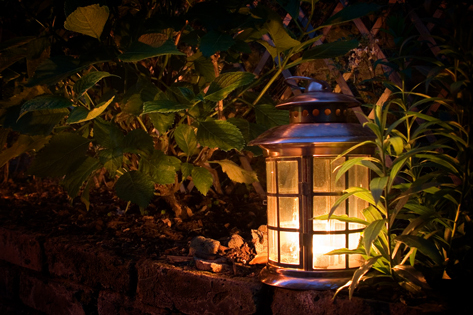 Using outdoor lanterns is a great way to make your garden more homely at night and add security. Outdoor lanterns come in many styles, from candle to electric, Victorian to Asian and can be used to outline walkways, driveways, steps, and to light doorways. They work and look great on patios, decks, porches and around swimming pools. Other uses for them include events such as a wedding reception, Halloween, Christmas, parties or even for camping. Like any other exterior lighting equipment, buying high quality fixtures will not only look great but will keep maintenance cost down. Outdoor lantern prices can range from $10 for simple paper lanterns to $150 for more elegant Victorian brass steel lanterns. Candle vs. Lights or Solar? If you are looking for permanent garden light fixtures that will be used regularly and requires low maintenance, then electrical outdoor garden lights work best. Outdoor lanterns for candles are ideal if you plan on using them occasionally, as they require you to light them every time. The added benefits of candle lanterns are that even the small ones can provide a heat source during chilly nights, they can also be used as a form of insect repellent. Candle lanterns are also more portable and are ideal for tabletop lighting, as they don’t require any wiring. Another option is to use solar outdoor lanterns. Solar garden lights have gotten to the stage where they shine brightly, and can last the duration of the night. They have gotten cheaper and now come in a range of different styles and sizes to fit any garden design. Using solar outdoor lanterns gives you the option of having permanent low maintenance fixtures without the complexity of electrical wiring. They are low maintenance, easy to install and don’t need any timers to turn them on or off. They are also more cost effective as they don’t cost anything to run. The choice of outdoor lanterns include simple, functional or more elaborate and decorative. The different light sources: candle, electrical, LED or solar powered. The different forms of outdoor lanterns include: hanging, wall attachments, floor, table or camping lanterns. The most popular design style is Victorian but other style options include: Moroccan, Japanese, Chinese, rustic/lodge, traditional, contemporary/modern, paper, and wooden. The easiest lanterns to install are solar powered, as they do not require any wiring or easy access to light candles. The most common model is the hanging outdoor lantern and can be fitted and hung from gutters. Other kinds will need a lamp post, a pole, hooks, be mounted to a wall, or will come as a set of string lights. When it comes to choosing outdoor lanterns for your landscape lighting design, there are a number of options to choose from. From the different light sources, forms, and design styles, outdoor lanterns can easily light up and add elegance to anyone’s garden.